THEN the owners of Matching Half will spend 200% of profit on a bike trailer and reusable food storage containers. Want that feel good feeling? Join the Wigg Party in helping support a small local business do something awesome for our neighborhood: They've committed 200% of what **WE** spend to purchasing a bike trailer so they can haul produce from a farmer's market car-free. Matching Half Cafe brought in 300% of what they would normally make on a rainy Saturday afternoon. 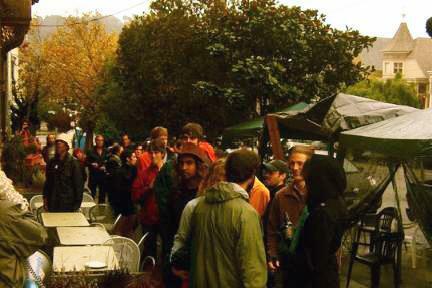 The NOPA community showed up in force, brought live music and a whole lotta bikes. Matching Half put $863 dollars towards a bike trailer, reusable food storage containers, and piloting the use of organic milk.